Do you or your kids ever grab an unhealthy, sugar-laden snack or drink as you wait in line at the grocery store? Even if your shopping cart is filled with healthy foods, checkout lanes often tempt you and your kids with a less-than-healthy snack. A healthy check-out lane/section helps ensure you don’t make an unhealthy choice as you leave the store. The Olathe Ridgeview Hy-Vee is now offering a healthy or family friendly checkout section located up front by the registers that contains more nutritious fare rather than the usual candy, snack cakes, chips and soda. Sometimes it’s hard to know if even a healthy-branded snack is actually good for you. One of the great things about the new section is all of the items have been hand selected by a registered dietitian. 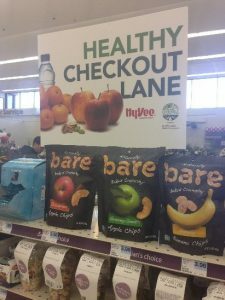 Jamie Jarvis, MPH, RD, LD, the Olathe Ridgeview Hy-Vee’s in-store dietitian, is behind the push to make the check-out lanes a place for healthier options! Set near the express lanes, Jarvis has fitted a full section that is free of candy bars, chips and other sugary indulgences for healthy options like fruit, bars, nuts and water. A large sign above the shelves helps customers spot the healthy section. Look for the sign bearing the Hy-Vee and LiveWell logos. “We have a lot of healthier options including energy bites that are made with whole food ingredients, trail mix, roasted chickpeas, fruits, and some of my favorite bars” says Jarvis. The snacks are higher in fiber and protein while also being lower in sodium, sugar, and trans fats. While all of the foods in this section are healthy for you, it’s important to still read the labels and pay attention to portion size.These well-balanced snacks help to not only curb your hunger, but also fuel your body to keep you full for several hours. “The snacks that we have here are not only healthy for you, but you know that you can make a choice that will sustain you until your next meal,” Jarvis added. Is it time to get your snacking on track for better health? Stop by the Olathe Ridgeview Hy-Vee and check out the new healthy checkout section!